Chicken quarters packed with grated haloumi and herbs. 2. Combine the stuffing ingredients in a small bowl, season with salt and pepper and toss together. 3. Thoroughly pat the chicken dry with paper towel. Using clean fingers, gently and carefully separate the skin from the breast, then push the stuffing under the skin, spreading as widely and evenly as possible – be very careful not to tear the skin. 4. 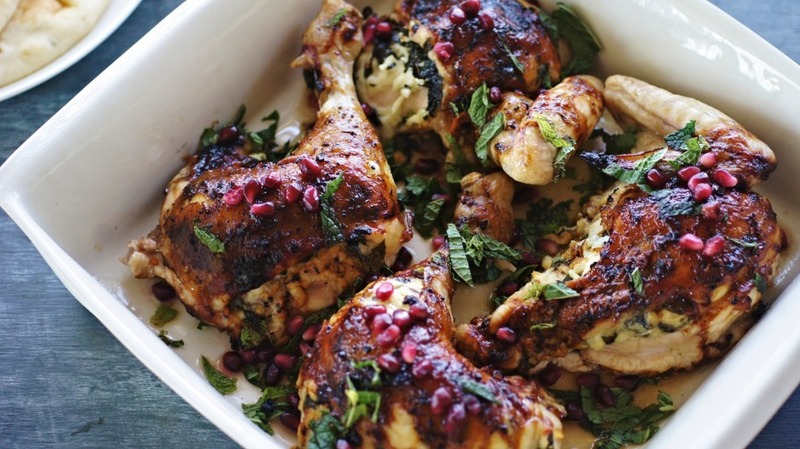 Place the chicken pieces in a roasting tin, top with the oil and pomegranate molasses, toss in the lemon wedges, and roast for 45 minutes or until the skin is golden brown, the juices run clear and the meat is cooked through. 5. Remove from oven. Serve topped with Greek yoghurt, coriander and pomegranate arils.